After shaking off the modest 6% correction of January, the S&P 500 Index (SPX) has reversed higher and is again approaching a test of long-term channel-top resistance currently sitting at 1,880 (but rises over time). From a technical perspective there is a big different from the current set-up and its prior channel-top challenge of December 2013. Back then, weekly technical oscillators including stochastic studies and RSI (Relative Strength Index) were each in an overbought condition with weekly MACD (Moving Average Convergence/Divergence) rising bullishly. 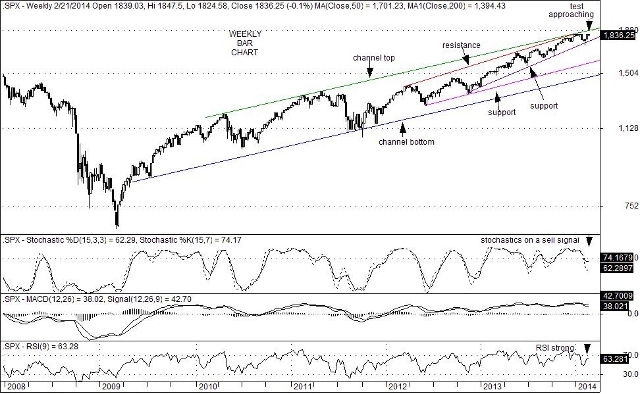 At the moment however, those technical measures now show that weekly stochastic studies are currently on a sell signal with MACD declining bearishly. In addition, RSI is rising bullishly and is strong but is not in an overbought condition. What does this difference mean? It suggests that while the current price-action is bullish, it does have a bearish drag to it. However, by the time that the next challenge to channel-top resistance does occur, the chances of an upside break will have oddly increased due to the absence of an overbought condition. That does not mean however, that the odds are good, they are just better. Nevertheless, U.S. equities remain attractive to global investors due to reasonable earnings growth expectations. Recent signs of a pick-up in consumer loan activity have added to the optimism for growth. Further, equity prices in the U.S. have put in an impressive showing in recent weeks despite worries over growth expectations in China and Europe, and a sub-par Q4 GDP performance in Japan. In addition, political turmoil in Ukraine, Thailand, Venezuela and Turkey have barely dampened stock purchases in the U.S. (compared with contagion worry that impacted equity valuations during the debt crisis in Greece that began in 2010). As a result, a test of key channel-top resistance currently sitting at 1,880 (but rises over time) will likely be of major importance to both investors and trend followers alike. This entry was posted on Monday, March 3rd, 2014 at 11:21 am	and is filed under The S&P 500 Index (SPX). You can follow any responses to this entry through the RSS 2.0 feed. You can leave a response, or trackback from your own site.